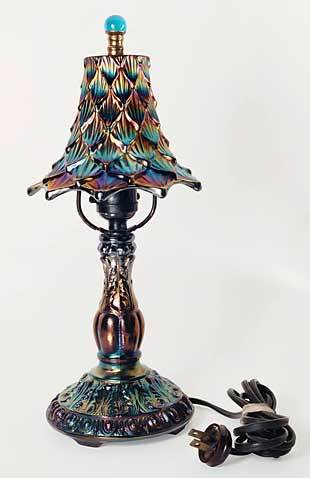 A lot of controversy surrounds the origins this lamp. The base is known to have been made by US Glass and is sometimes found with a cloth shade. Yet, the example shown here is typical with a Lined Lattice vase that has been used as the shade. Lined Lattice, of course, was made by Dugan. It's entirely possible that a distributor bought both the bases and the vases and combined them for a special order.